Late last year, I was reading someones Christmas wish list and it included a Merge Cube. This was from a thread about AR on twitter. My interest piqued, I did a quick search for Merge Cube. It was brand new, Augmented Reality and looked like a lot of fun. Quickly searching all the online retailers in Malaysia and I couldn't find any, a quick check of Amazon found a seller that was willing to ship to KL (it was about 3 times the price you can get them in the US). I figured it was still worth having a look at. To my extreme pleasure the Merge cube arrived in less than a week. The Merge Cube is a foam cube about 7cm by 7cm it acts like an AR projector screen. Using any of the Merge Cube apps, you can project a 3D image on to the cube, as you move the cube the image moves. The kids and I got straight into it, we started downloading some apps and started playing. Some of the apps were not available on the Australian or Malaysian App store, but we still managed to find a few. It was pretty cool to be able to hold a beating heart in your hands or to turn a skull around to see it from every angle. The cube is very responsive and tracks the image very quickly. We downloaded a few other apps Mr Body and Defused, but the above two are my kids favourite. My son who is in early years (3 and 4 year olds) wanted to take the Merge Cube to class to show his teacher because they were learning about bones. Once we showed the teacher she got excited and asked me to bring it back so the whole class could experience holding a skull when their grade 6 buddies came to visit. We used an iPad air in a stand so that the kids didn't need to hold the iPad and the cube, sometimes they found it a bit tricky to see the image and hold the cube, but they got there in the end. It was just good timing that the Early Years class were learning about the human body when the Merge cube arrived. My next challenge is to try and find a way to get reasonably priced cubes here in Malaysia and explore other apps that could be used in other classes and subject. It would also be very cool to use a Merge cube in a breakout.edu and maybe even get a merge cube VR headset. Sidenote - I just started playing with defused and it is excellent, great problem solving - this is one app I want to use in class. 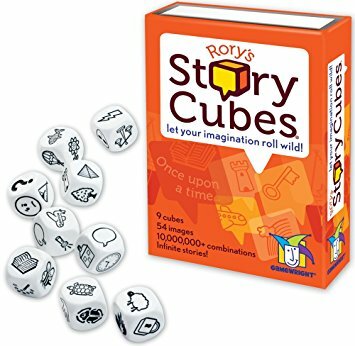 My kids love their Rory's Story Cubes, there is even an app (I haven't purchased it yet as I prefer them rolling real dice and telling stories to each other in real life). 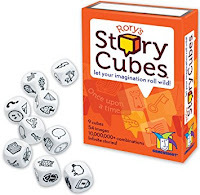 Story Cubes are fun, creative and improve literacy. Story tellers roll a set number (usually 6) of dice and then you attempt to tell a story using all the images on the dice. The cubes are not cheap, but they are lots of fun and are a great classroom activity. I have seen teachers make their own paper story starters using random images and distribute these to their class. This got me thinking, could this be automated using Google Docs, Sheets and some add ons? I started playing and created my own Emoji story workflow. 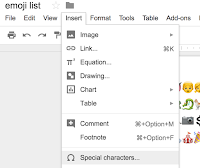 Users (students) fill in a form with their email address and they are sent a Google doc with six emojis they use to write a story. 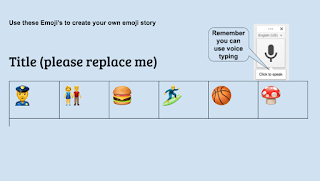 For the story writer it is as simple as that, enter your email address and get a set of emojis. Because it is a Google Doc, the writer can either type directly into the Doc or use the voice typing option to dictate their story. As the teacher I am the original owner of the doc so I can see what my students are writing. 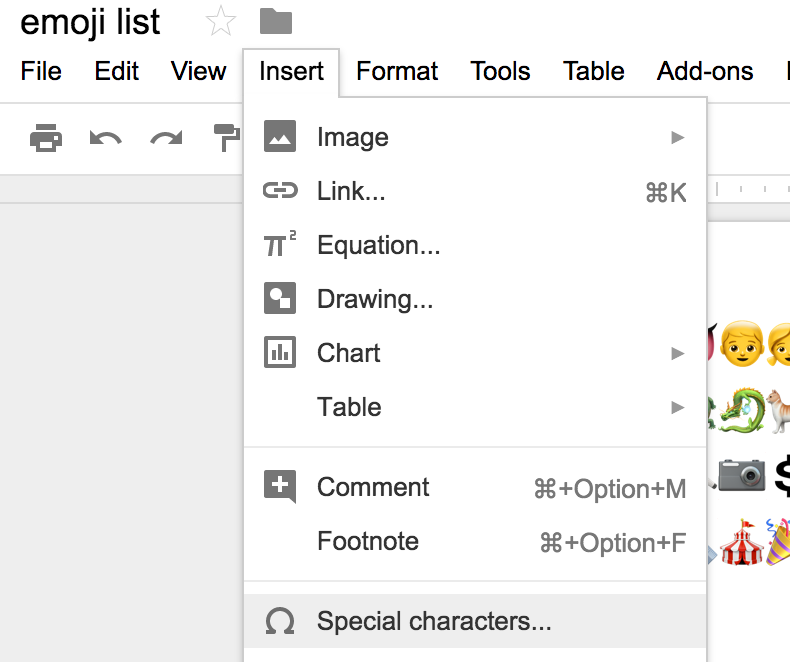 The basic workflow is Google Form to Google Sheet, then copy down a formula to randomly select an emoji from another sheet. 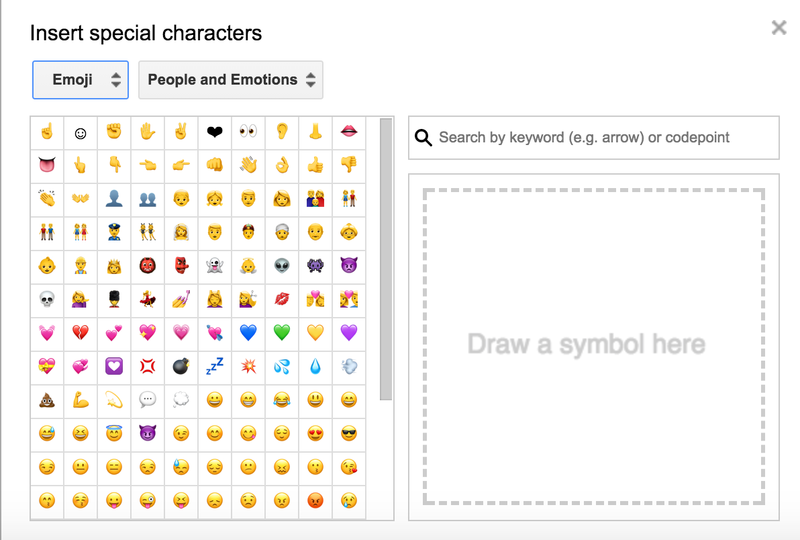 These emojis are then inserted into a Google Doc using Autocrat and the Google Doc is shared and emailed to the email address entered in the form. Do you want an emoji story? In my Google form responses sheet I created a new sheet called emojis, this is where my library of emojis is stored. Basically it is six columns of emoji, these are the emojis (images) that are randomly selected for each box in my Google Doc. One Emoji is selected from each column. I could then copy and paste from the Google Doc into each column of the Google Sheet. Here you can add different Emoji and set it up the way you like. You might want to have 2 columns of characters and two columns of objects, or just use three emoji picked at random or one column of 100 emoji picked six times. In my version there are 16 emoji in six different columns, that gives a possible 16777216 different story combinations. In each cell I used the following formula to randomly select an emoji from the emoji sheet. index returns the contents of the cell selected from the range A2-A17 on the emoji sheet. randbetween randomly select a number for the second part of the index formula. Copy down is pretty easy to set up and there are plenty of tutorials and help online. Autocrat is a Google sheet add on that allows you to run merge jobs on a Google sheet that does a variety of tasks. I use it to create a Google Doc from the Merge doc and then share the doc with the email address shared. 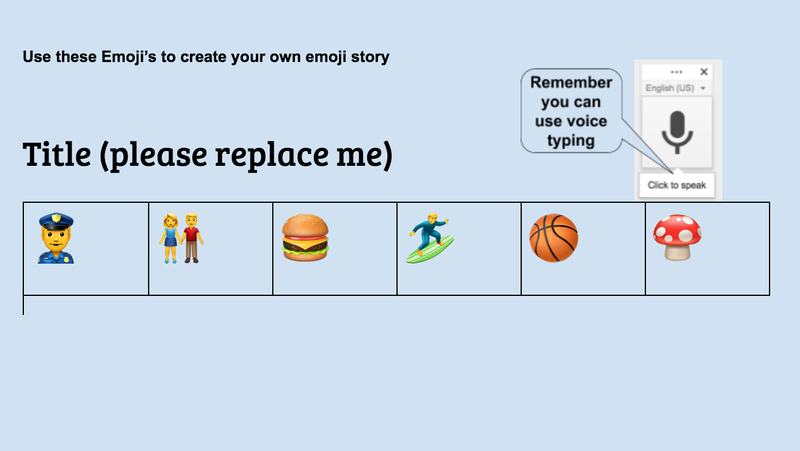 It also sends an email saying that you now have an Emoji story ready to write. That is about it, pretty simplish and it can be used as it or make your own from all the resources here. If you create your own you get to set it up the way you like and you become the owner of the Google Docs that are created, that way you can easily view and give feedback on the stories they create. A few classes here at IGBIS have been using it and the kids love it, as long as they put in their correct email address. Have fun and play and please share any thoughts or your own version of Emoji Stories.